Interested in the c-section and VBAC rates in California? This government website lists the overall & primary rates of cesarean section, plus VBAC rates, for each California hospital in 2005. Los Angeles Community Hospital: 57.4% (46.9% were primary cesareans). 1 VBAC (not percent--one VBAC period). Community and Mission Hospital: 47.4% (32.2% primary). 2.1% VBAC rate. East Valley Hospital Medical Center: 44.9% (30.7% primary). 0 VBACs. Pacifica Hospital of the Valley: 41.1% (26.2% primary). 1.8% VBAC rate. Citrus Valley Medical Center, QC Campus: 40.6% (27.4% primary). 3% VBAC rate. This is a recent press release from Jennifer Block, author of Pushed. August 30, 2007, New York — Just in time for Labor Day, Pushedbirth.com offers a source of candid, uncensored, must-know healthcare information not just for women who are pregnant or thinking about becoming so, but for anyone who's interested in how American women are giving birth today. The U.S. may be known for its advancements in medical technology, but according to a 2006 survey, just 2% of pregnant women receive optimal care when they go to have the baby. Instead, most women have what author Jennifer Block calls a “pushed birth”: they are induced into labor or sped up with artificial hormones, labor and deliver lying flat on their backs, or, in nearly one-third of cases, give birth by major abdominal surgery. Pushedbirth.com is a must-read for a better birth. Best of all, it’s a quick read. With so many pregnancy guides beckoning at the bookstore, Pushedbirth.com provides an eye-opener in minutes. After viewers click through six content pages, they can follow links to other resources or scroll through the blog, which is updated daily with news, expert tips, and birth stories. I saw this Sesame Street montage of nursing mammals--including human babies!--and had to share. I just finished it, and it is one of the most powerful books I've come across in a very long time. That's saying a lot, because little of the information in the book was new to me, and yet it still blew me away. I wanted to stay up all night to finish it, like Sage Femme, but frankly I cannot pull that off with a round-the-clock nursing baby! So I forced myself to put it down at 11 pm yesterday and finished it today. What's best for women is best for babies. And what's best for women and babies is minimally invasive births that are physically, emotionally, and socially supported. This is not the experience that most women have. In the age of evidence-based medicine, women need to know that standard American maternity care is not primarily driven by their health and well-being or by the health and well-being of their babies. Care is constrained and determined by liability and financial concerns, by a provider's licensing regulations and malpractice insurer. The evidence often has nothing to do with it. 1) ACOG recently decided to support elective "maternal request" cesareans--surgery for no medical reason--as ethically justifiable (even though the medical evidence shows that cesarean sections for no medical indication lead to higher morbidity and mortality for mothers and babies, rising sharply with each successive surgery) yet refuses to allow women to choose out-of-hospital birth, direct-entry midwives, or, in many hospitals, VBACs (even though the medical evidence clearly shows that these choices are safe & reasonable). 2. Women have freedom of movement during labor. 3. Interventions are medically justified rather than routine. 4. Women have continuous emotional and physical support. 5. Pushing occurs in any position but flat-on-back. 6. Mother and baby are not separated. In other words, 98% of women received sub-optimal care. Surprisingly, this book gave me a greater sympathy towards obstetricians (well, some of them at least). Many of the physicians she interviewed held great respect for the natural, physiological birth process; bemoaned the current state of malpractice litigation, VBAC bans, and the dogma of automatic surgery for breeches; and secretly supported home birth midwives--often facing censure from their peers for their views. Pushed shows a maternity care system that has gone malignant. Instead of being a tool to aid women when pathology arises, it is now our master. Obstetricians, nurses, midwives, birthing women and unborn babies are all slaves to the machines and the technologies that they have created. Birth, for most women, is managed by drugs, hormones, and clocks, rather than being a chaotic but gloriously intricate and rewarding physiological process. In this system, no one wins. Instead of being bathed in a complex "cocktail of love hormones," as Dr. Michel Odent put it, women are on morphine drips in post-operative wards. Their babies are intubated, suctioned, and injected. Mothers are separated from babies, vaginas are separated from birth, and birth is separated from labor. Let us bring them into harsh rooms with bright lights. Let us make them lie on their backs on hard narrow beds. Let us tether them to machines so they cannot move. Let us make them stay silent and make no noise with their pain. Let us expose their most private parts and threaten them with cold steel. Let us make them push their babies upwards, against the pull of the earth...In these conditions, labour swiftly becomes unbearable and pain relief becomes a woman's only hope....This is not the natural cry of a woman in labour bringing a child to birth, although if you have only ever witnessed childbirth in a medicalized setting you might be forgiven for thinking so. This is the screaming plea of a tethered animal in pain. 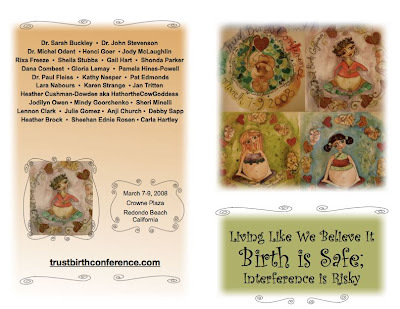 ...to the Trust Birth Conference? Just added to the list of presenters: Hathor the Cowgoddess!!! (aka Heather Cushman-Dowdee). 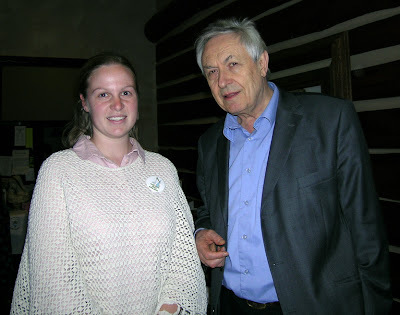 Here's a picture of me from 2005 with Michel Odent at The Future of Birth Conference in Columbia, Missouri. I don't care for movie stars or famous athletes, but I was definitely star-struck when I met Dr. Odent! I've been thinking a lot recently about my paradigm of childbirth and how I got from point A (assuming I'd birth in a hospital with an OB and epidural) to point B (giving birth at home unassisted). Several things I've read, in particular, stand out in my mind. They made me uncomfortable. They challenged assumptions I had held about birth. I ready many of these after I thought I had already been converted and was done paradigm shifting! 1) Peggy Vincent's Baby Catcher. This book changed me from thinking "I would definitely want to give birth in a hospital. Maybe with a nurse midwife--that sounds nice" to "Of course I will give birth at home!" Peggy Vincent is a fantastic story teller, and I still crack up in parts even though I've read it oh, at least 6 or 7 times. She is more interventive than I would personally feel comfortable with, something I have noticed more after exposure to unassisted birth and to midwives advocating unhindered births. 3) Midwife Jeannine Parvati Baker's words. The first two paragraphs are from her book Prenatal Yoga & Natural Childbirth. The last two paragraphs are from an article called Shamanic Midwifery: Hands That Heal Birth. My community made me a midwife by asking me to attend births. Rather than getting trained by an institution, and learning a medical set of rituals to take women through birth, I apprenticed directly to birth itself. My promise as spiritual midwife is to honor the journey, be attentive to what presents itself, and remind a mother by my presence that she already knows how to give birth. I trust that if a woman consciously conceives her baby without the help of experts, she is able to give birth unassisted by the medical experts....In over a generation of attending births, every woman I have midwifed has given spontaneous birth. Once I was called to a birth and forgot to bring my birthing kit. Then I realized that I am my midwifery kit--I had my ears through which I could hear the baby's heart, I had my hands through which I could feel the baby, and I had my heart--which loves the baby earthside. 4) This article by Gloria Lemay called "Interventions." Not the typical Big Guns that we natural birth people love to denounce: epidurals, Cesareans, inductions, EFM. Nope, in this article Gloria talks about the interventions that well-meaning midwives do, without even realizing how they are affecting the birth process. One of the most shocking and unsettling paragraphs at the time for me was where she discussed A Clear Road to Birth. I will end this post with a long excerpt from her article, which appears in Midwifery Today (22 September 2002). "The first intervention in natural childbirth is the one that a healthy woman does herself when she walks out the front door of her own home in labor." This quote is an attention grabber and one that should set us all to thinking. We know about the "cascade of interventions" that sends most North American births down a tunnel of medical mishaps strip membranes, Pitocin gel induction, continuous fetal heart monitoring, pain medications, distress in the infant, cesarean, post-surgical infection, breastfeeding problems, postpartum depression, etc., etc., etc. Iatrogenic meddlesomeness at its most blatant is easy to spot and condemn. We like to shake our heads, point our fingers and tut-tut-tut about this type of intervention. But what of the interventions that we don't see, the ones we are guilty of ourselves? The Oxford dictionary defines intervene: "to interfere, modify course or result of events." Something that seems as small as turning on a light could be classified as "an intervention." Is it an intervention to wear perfume to a birth? To monitor the heartbeat of the baby every half-hour? To leave a clock within the mother's view? To watch the mother? To speak to the mother? To ask her to take a walk outside? To tell her husband to get in the water tub with her? Do midwives take any time at all to ask themselves these questions? What would "the course of events" be like if we weren't there? How could we possibly know? Recently I came into possession of an amazing video. This video is the raw home movie footage of the births that are shown in the unassisted birth film A Clear Road to Birth. There is no attendant present at the births. The families have, for the most part, just put the video camera on a tripod and let it run. The result is an amazing view into a place that I have never been privileged to enter--a birth that follows the natural course of events. I found it difficult to watch because it is so very intimate, and I wasn't sure that they'd want me to ogle their beautiful, private family moments. It is a sacred film. I came away from it with questions about how my presence at a birth affects the behavior of all the participants. The women on this film are not asking, "How much longer will it be?" They are not saying, "I can't do it anymore." There is no illusion or possibility of some other woman "saving" them. They are going to do it themselves, and they seem to have an inner core of resolve about it. Their husbands and children mostly seem "surprised" that the baby is really there. This is unlike births where there is an "expert" present, and the waiting and watching seem to go on forever. This film of unattended births leads me to question, "What about women who have unassisted prenatal care?" We are told that prenatal care is essential. We believe it is a cornerstone of good maternal/natal health. But is this true? Are there interventions that take place in childbirth classes that are subtle and affect the course of events? If we think of the spoken word as "an intervention," we must wonder if we are causing changes in the course of the birth long before the membranes release. I cringe at some of the "meddlesome midwifery messages" that women are given at prenatal checkups. Messages can be imparted both verbally and nonverbally. I remember when I took prenatal classes 25 years ago, the nurse managed to impart the message that she didn't approve of breastfeeding with just the look on her face when she said, "How many of you are planning to breastfeed?" Her attitude changed the course of events for a lot of the women in that class. It was absolutely an intervention. I have learned a lot about how to question my own interference in birth from listening to Michel Odent. His message is repeated over and over: "The most important thing is do not disturb the birthing mother." What does a nice midwife do that would disturb? Several years ago, I went to a birth as assistant to the midwife. I was assigned to take a video of the birth and so I familiarized myself with the family's camera and began to do a little filming of the mother while she was in the water tub. I was getting some nice footage when, all of a sudden, the room went completely black, and I couldn't get an image in the camera. I looked up to see what had happened: the brother-in-law of the birthing mother had turned out the lights. I went over and turned them back on so I could get on with filming and, presently, the man came back and turned them out again! I was very annoyed and, in that moment, I realized that he was right! He was more in tune with what his sister-in-law needed than I was. 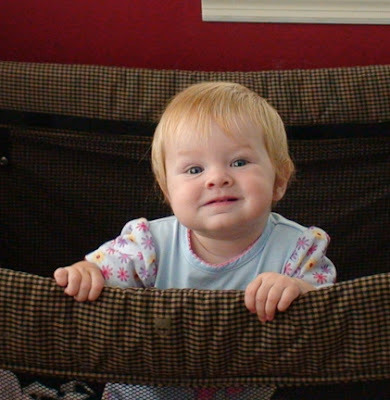 Birth seems to flow best for human beings in the same conditions as most other mammals. Darkness, familiar smells, privacy and quiet are the main ingredients for a smooth birth. Who in North America can give these simple things to a birthing mother? Are we willing to trade monitoring and charting for births that truly flow along smoothly? Are we willing to sit, out of view of the woman, completely still while she focuses inward and makes her own journey to meeting her child? Can we forgo the acknowledgement and appreciation for all we "do" and be deeply satisfied with "being" unobtrusive? Remember that you are facilitating another person's process. It is not your process. Do not intrude. Do not control. Do not force your own needs and insights into the foreground. If you do not trust a person's process, that person will not trust you. Imagine that you are a midwife; you are assisting at someone else's birth. Do good without show or fuss. Facilitate what is happening rather than what you think ought to be happening. If you must take the lead, lead so that the mother is helped, yet still free and in charge. 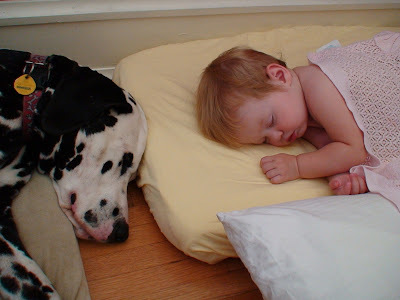 When the baby is born, the mother will rightly say: "We did it ourselves!" At the upcoming Trust Birth Conference next March, one of the speakers will be Dr. John Stevenson, an Australian family doctor who has attended many home births. 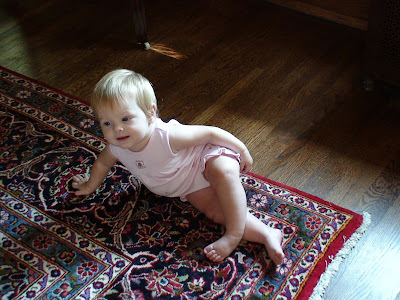 He describes his style of practice here: Lessons from a Homebirth Practice. I am very excited to meet him. Carla Hartley, founder and director of the Ancient Arts Midwifery Institute, is currently collecting his wisdom from the births he has attended. I will definitely buy the book once it is out! I haven't started Zari on solids yet (unless you count all the bits of lint and dirt she picks up off the floor). Today, though, I wanted to see what she'd do if I gave her some food. So I pulled out a refrigerator pickle--sliced cucumbers marinated in water, vinegar, sugar, salt & pepper--and she went crazy over it. When it first made contact with her tongue, she pulled a face. But then she kept at it for about 10 minutes! Now the cucumber slice is a soggy mess, but it kept her busy for several minutes while I typed. I understand why parents carry around little baggies of Cheerios. Can anyone say distraction technique? Here is a vision of how hospital birth could be. I don't know if I feel encouraged or discouraged about this birth--encouraged that such a respectful, patient OB exists, or discouraged that this kind of birth doesn't happen more often in hospitals. I love the pictures of mom laboring on her hands & knees in the middle of all of the technology, and the doctor in a plain old t-shirt looking every bit as casual as the dad. Zari and I are going to Arizona in a few weeks to visit a good friend and to attend a short birth conference. I've never been to the Southwest before, so I am sure it will be an adventure. I anticipate lots of fun in the swimming pool and late-night conversations while we nurse our babies. Well, maybe until 10 pm, because that's about as late as I can keep myself awake these days! Also in the works is a Quadruple B get-together (Birth & Babies Bed & Breakfast) that I will be hosting at our B&B this fall. Once I've decided on the date, I will post details here and perhaps some of my IRL and virtual friends would like to come visit for a long weekend. Hint hint...start saving your pennies now! Free accommodations at my Arts & Crafts B&B, of course! We'll have lots of nurslings, lots of girl talk, and of course lots of good birth stories to pass around. Just out: an article about the medicalization of childbirth in Canada. It's called "The New Normal", written by Elizabeth Payne in The Ottawa Citizen. Another radio program about home birth, including a discussion with a CPM about her views on unassisted birth. I've typed out the segment concerning UC below (since I need the transcripts for my dissertation). Julie: I’m curious if you ever consult with women who want to give birth without any assistant. Susan: I have got those calls. There’s a movement called unassisted birth, and there are women who are having their babies without a midwife and with their partners. And if they have other children, with those children. I’m sure the numbers are very, very small. There are very few women who are looking for that kind of an experience. From my reading of it, it looks like some of those people believe that birth should be a very exclusively family-centered experience. Some of those women, from what I can tell, came to that decision out of really bad former experiences. I imagine some of those were hospital births and maybe some were home births. Having a midwife that didn’t meet their needs or having doctors that didn’t meet their needs, and they’ve decided to do an unassisted birth. I imagine some are having unassisted births because they can’t afford to pay for their birth, and that’s a frightening and horrible thing. Julie: That sounds like a very scary prospect, I guess, but it’s not something you want to discourage people from doing if they’re very determined to do it. What kind of advice to you give when people say to you, “I want to do it myself”? Susan: I rarely get consulted on the subject. The only time I’ve ever been consulted was when somebody called and said, “I’m planning this. If I needed a midwife, would you be willing to come?” And I wasn’t. What she was saying was, if there’s a problem, would you come. And I’m not really interested in cleaning up somebody else’s problem. My job, in my opinion, is to prevent a problem from occurring if I can and then deal with it if it’s something I couldn’t prevent. So I wouldn’t advise somebody not to have an unassisted birth if that’s what they were committed to doing. I think I would take the same approach I take with my own clients, which is educate yourself, make informed choices, and take responsibility for your choices. Julie: Are there any advantages as you see them to doing an unassisted birth? Susan: In line with my thinking that if it’s empowering to have a natural birth at home with a midwife, I would imagine it’s even more empowering to have one without a midwife. If you have a birth that goes beautifully and you know you fully did it without anybody needing to be there, that would be a pretty life-altering experience. In preparation for this twin birth, I just watched a video of a woman giving birth to twins unassisted. Twins, unassisted--that’s amazing. The second one was a breech, which she didn’t know. There were a few swear words as she discovered that the second one was a breech, but she just calmly birthed her babies, catching her own babies, and her husband was shooting the video of it. I just thought it was amazing how confident she was and how happy she was. Yeah, I think that’s one of the big advantages of it. This interview on freebirth just came out on the BBC. 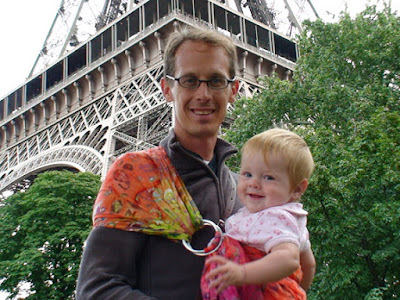 The show's host first interviews James and Julia Wilson, who had a midwife-attended home birth with their first baby, and an unassisted birth with their second. The next part of the program features Dr. Sarah Buckley and Sue McDonald from the Royal College of Midwives. Announcer: Those who want to give birth at home had a bit of a boost earlier last year, when the government promised that every woman who wants it will be able to have a midwife-assisted home birth by 2009. But there’s a growing movement of what are known as freebirthers. They’re women who decide to give birth at home without any medical assistance. Kathy Caton talked to Julia Wilson. Julia gave birth to her first child at home with a midwife, but decided with her second to go it alone. What gave her the confidence to go ahead? Julia: I read quite a bit about what happens in the process of giving birth, so I felt quite confident in myself to be able to handle the situation. Whereas if you leave it up to the midwife and do your birthing experience with the midwife present, she’ll take over and do all the medical side. But I think it can be done by the woman herself. 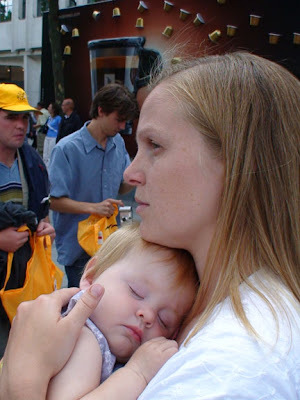 I also spoke to other mothers--not that other mothers could give me much positive feedback. Most birth stories I hear are horror stories, which is very sad. Kathy: And why did you choose freebirth? Julia: I had a successful first home birth and that was one of the major reasons. I thought, “well if I’ve done it once at home with a midwife present, then I can definitely do it again. I also dislike hospitals. I’m visually impaired so I like to know my surroundings well. Hospitals also make me feel like a victim. When I go in, I’m automatically the patient, I’m in pain, and I’m suffering some medical problem--which birth isn’t. James: I’m James. I’m Julia’s husband. Kathy: We’ve been hearing about the whole freebirthing experience. What were your thoughts on it? James: I was quite happy with it really. Due to Julia’s visual impairment, anything that made her more comfortable with birth is good for me. Obviously, we’re not really extreme on the side of freebirth. The hospital is right next to the house. If there was a disaster we could always go in. Kathy: Comparing your first and second birthing experiences, why were you unhappy with how the first birth had gone with the midwife? Julia: I wasn’t unhappy. I had a lovely birthing experience the first time. But I felt although she was a lovely woman, she was still a stranger in my house. To be doing something so intimate as giving birth--for me--I wanted to have people that I have no inhibitions about. And I did have [them]. It’s only now, looking back, after two births and only having James present the second time, how inhibited I felt the first time. Kathy: What was your role? What were you doing? James: I was just present, I think. Holding Julia’s hand and trying not to answer the phone because other people were phoning us. Then after the baby was born, Julia lay back a bit and I got passed the baby, and I gave her a bath. Kathy: It has been said that freebirthing is irresponsible. Julia: Well I think that’s quite patronizing to women because they can make that choice themselves. Is it irresponsible? Have I checked that I’m physically healthy? Have I been to the midwife and checked that my pregnancy is going well? If I’ve done these things, then it’s not an irresponsible thing to do. Kathy: Julia and James Wilson. So how good an idea is it to go into labor with no medical support? Sue MacDonald is from the Royal College of Midwives. 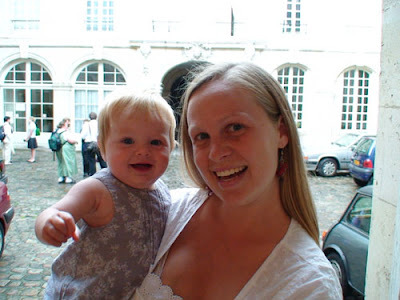 Dr. Sarah Buckley is an Australian GP and the author of Gentle Birth, Gentle Mothering. Sarah, why did you choose a freebirth for your fourth child? Kathy: What was your surprise at the end? Sarah: She actually came out unexpectedly breech. Kathy: One might have thought that you would have wanted some medical expertise. Now I know you’re a doctor. But for a breech baby to come out, surely having a doctor there would have been helpful. Sarah: Well as I said I’m a doctor myself. My partner’s also a doctor. I think what happened at that moment was my instinct kicked in, and I did the thing that was totally appropriate. Now I’m certainly not advocating--actually I don’t advocate freebirth for anyone; I think it’s a really personal decision, and I wouldn’t advocate freebirth in that situation for other people either. But if I compare what might have happened if I’d had a more medicalized form of care, it would have been very difficult at that time, in the year 2000, to avoid a cesarean. It was the peak of the cesarean epidemic, if you like, for breech babies. So if I compare what happened for me with that baby with that possibility of a highly medicalized outcome, I think overall I made a very good choice. I think that the outcome for my daughter and for me and for my whole family was really enhanced because we made a very, you could say, extremely low technology choice. Kathy: Sue, we’re getting the feeling that even a midwife present at a birth is an intrusion. Can you accept that? Sue: Well, not totally because I think midwives are really very important to women, and you need to see them as a guide and support for the whole experience. But what Julia’s and Sarah’s stories both illustrate is the importance of, first of all, the midwife being able to get a relationship with the woman and work out together, as partners, what the woman wants for that pregnancy, for that labor and that early parenthood. It’s that sort of interaction and discussion that needs to take place in order for the woman to really get the experience she wants so that she doesn’t feel it’s an intrusion. Kathy: What would you say a midwife crucially adds? We’ve heard from two women who’ve successfully done it on their own. Okay, one of them is a doctor and had a breech, but it was successful. Sue: I think it’s about relationship, and I think it’s about guiding and supporting women through the experience. Obviously, both Julia and Sarah have done a lot of work and a lot of reading in preparing themselves, and that can be supported by midwives. And midwives don’t have to--and usually don’t--take over the whole business. They’re there as support and advice. And educating women rather than pushing in and taking over the whole experience. Kathy: Sarah, it’s difficult to be confident, isn’t it, that a woman knows her own body well enough to know when something is wrong. They don’t all have your medical training. Sarah: No, that’s right. Can I just comment on what Sue said? It concerns having other people around. One of my understandings around this is scientific. I think if we look at the hormonal physiology of labor, which I do in a lot of detail in my book, we can see that having strangers around or the woman feeling uncomfortable in labor, actually raises the levels of her hormones of fight-or-flight: adrenaline and noradrenaline. They actually physiologically slow labor down. Not only that, they can divert blood away from the uterus and baby to the major muscle groups, because they’re there for fight-or-flight. They’ve evolved through millions of years of evolution to help women to have a safe labor and birth. The trouble is, with a lot of people around--and I know some midwives can have a very low-key presence--but just that presence of strangers as Julia describes it can activate that fight-or-flight reflex. So I’d say that it’s very important for women to feel totally comfortable and totally relaxed and, as I say, private and safe and largely unobserved in their labor. That’s actually quite a difficult environment to set up even for the best midwife. Midwives are my heroes. I wouldn’t say anything against them, but it is quite a difficult situation. Especially with the regulations; the midwife is largely there to observe the woman and make recordings. That’s part of her job to do that. So it’s a difficult role. Kathy: Sue, can you see that? Mammals are sort of designed to go and crawl off into a quite place completely alone for their bodies to react completely naturally. Could that be the case with the human woman? Sue: It’s absolutely so. There’s been quite a lot of research into this whole area. Indeed, the whole move towards home births and midwifery-led birth centers actually supports that. I absolutely agree with Sarah, because it is very important that you have that private feel. But you don’t need to have a lot of intervention and interference, because the midwife is there to monitor the labor and the wellbeing of the mother and baby, but she doesn’t have to be intrusive. Really, all that she’s saying is very similar, I think, to what I’m saying. About getting models of care that are truly woman-friendly and really finding out what is right for that woman, that baby, and that family. Kathy: Sarah, on the websites of which there are several, there’s trading of information about freebirth, like how to figure out if the baby is breech. How dangerous is it for women simply to be exchanging information like that? Sarah: I think when you choose to have this type of birth, what you’re taking on is a large responsibility and with that comes the responsibility to up-skill yourself as much as possible. This is one way that women can up-skill themselves. There are other ways; Julia talked about reading lots of books. There is information available out there. I think that women who choose this take a high level of responsibility, and it’s not just that they’re up-skilling themselves. It’s also in terms of arranging backups, arranging a flexible situation where they have access to advice, for example. Women may have someone they can ring up during labor. They may even have someone present there who has skills. Unassisted birth doesn’t necessarily mean it’s just the woman there. She may have a group of friends there, and that’s still a freebirth if none of them are actually the professional involved. Kathy: Sue, how do you react to those kind of websites and that sort of exchange of information? Sue: I think women always have exchanged information abut pregnant and birth, and that’s important for them to be able to have that experience. But on the other hand, there’s quite a lot of information that may be frightening or women may not fully understand. So I think having someone to support them, I think having some medical or midwifery knowledge is very helpful, even if it’s your own previous experience, because it can help you understand some of the terms and the reasons why particular things were done. Kathy: Sarah, there are women in the developing world who are crying out for medical assistance during their birth. Doesn’t it seem bonkers for privileged Western women to be taking what looks like a setback? Sarah: Hmm, that’s a good question. I think we’ve really also got to look at the nutritional status and the hygiene available to women giving birth, because I think that’s actually very different for women in Western cultures choosing freebirth than for women in developing countries. Because of their nutritional status, largely, those women are at high risk of complications and I think they do need midwives. If we look at healthy Western women, you could say that the need is low and the chance of complication is low because we are so healthy and well-nourished generally. Kathy: Dr. Sarah Buckley and Sue McDonald. Thank you both indeed for being with us this morning. If you have a view on this subject, please let us know. Would you consider giving birth alone, or do you think it’s misguided? We're visiting my parents for the week. Here's a picture of their first house. They lived in it the summer they got married on government land in Logan Canyon. They cut the poles themselves (of course!). 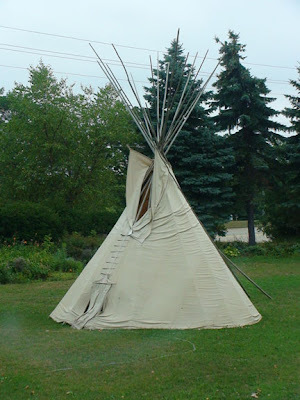 We usually put the tipi out every summer when we were growing up. One of my favorite tipi memories is watching the complete BBC Pride & Prejudice inside the tipi with my friends--thanks to a very long extension cord. Bath time with the cousins. Here's a recent book review called "Modern Childbirth: Failure to Progress" by Sarah Blustain. She discusses 3 new books about the culture of childbirth in America. I've read Dr. Wagner's book and am eager to read the other two. 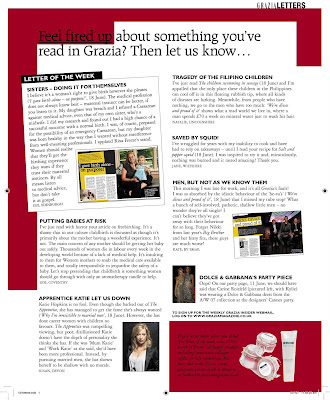 For my North American readers, here's the Grazia article I was interviewed for (Issue 120, June 18, 2007). Although it's in first person, I didn't actually write the article myself. I just gave it a final thumbs-up once Miranda Levy had put it together. It was based on long phone conversations, emails, and blog posts. Of course it only skims the surface of my pregnancy and birth experience, as well as why I made this choice. I think she did an excellent job, however, in summarizing the essentials. I also love the British-isms! ("sitting on the loo" for example). Paula Holland. "Birth--The 'Marathon' of Life." 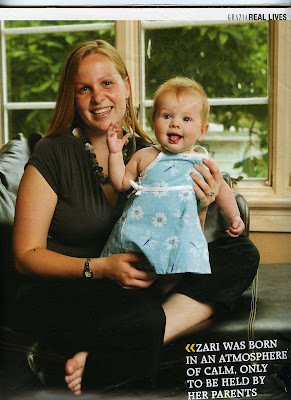 International Doula 15.2 (2007): 14-17. 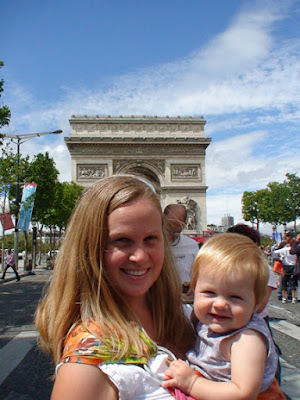 We got in late last night, but Air France lost all of our luggage except the car seat. So we are home, but don't any clothes or diapers or extra shoes. Our suitcases are still in Paris and might arrive tonight. We had an adventure at the Paris airport: somebody had abandoned a bag, and the French police/military/bomb squad all arrived and cordoned off a big section of the terminal and exploded the bag. It was the loudest noise I have ever heard in my life. I think that's why our bags were delayed, because by time the bomb squad was finished blowing up stuff, we were quite late checking in. 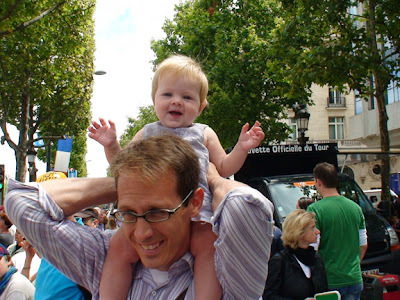 We were in Paris for the end of the Tour de France, so we went to see the race on the Champs-Elysees. We didn't know exactly when the cyclists would be passing by, and we ended up getting there a bit early. About an hour or two before the bikes arrive, there's a huge parade of vehicles (race sponsors mostly) of all sizes and shapes. Cars shaped like tires, water bottles, sausages...it's pretty fun. Semi trucks decorated with the sponsors' logos weave down the street from side to side blasting their horns. Lots of music and people talking on loudspeakers. We all were pretty tired after 2 hours of waiting, so we went back to the hotel before the cyclists ever showed up. Frankly the pre-race stuff is more exciting anyway. At the top of the Champs-Elysees, with the Arc de Triomphe in the background. Somehow she managed to fall asleep despite all the noise. At church in the Marais (Jewish quarter), about a half block from the Pompidou center. Our students have returned home, and we are on our own for a few days before we fly home on Tuesday. We drove up to Paris and found a very cheap, very sketchy hotel for 31 Euros a night, which is amazing for Paris. It’s near the Tour Montparnasse on a calm residential neighborhood, and close to about 4 different metro stops. This hotel is so sketchy it’s hard to describe. For starters, hotels in France are rated on a star system, from one to five. This hotel has zero stars. The stairs are uneven and slope sideways, so when you are going up or down you feel like you’re in a funhouse. Our room is quite small, and the bed is at best a full size. I can feel the springs on the mattress when I lie down. It’s a bit too cozy for three people so we made a soft bed on the floor for Zari out of extra blankets. I pick her up to nurse and lay her back down when she’s done. The sink in our room is starting to come off the wall, and in a last-ditch effort to disguise that fact, the hotel owners put a lot of caulk in the gap. The caulk, of course, is completely gray with mold. I don’t think the floors have been mopped since the hotel opened. I think I saw a cockroach (dead) on the floor too. There is of course no television in the room, but we do have a bidet! The toilet and shower are down the hall. Or rather, down the hall and down the stairs, since there is only one working shower in the entire hotel. One of the others no longer has a shower hose or curtain. The one on our floor has plastic tape across the door to prevent entry. More often than not there is no toilet paper in the WC. Back to the shower room: the ceiling is totally gray with mold, and it’s falling down in places. The light fixture is broken and now has just a bare bulb in the middle. The shower is tucked inside a small alcove. 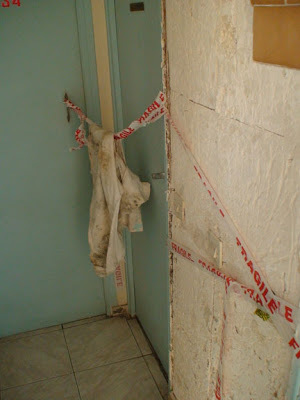 An odor of mold predominates, probably because there is no ventilation. (There is a small window, but it’s broken.) Mold is growing in all of the caulk and grout. The room’s door is peeling and starting to delaminate. I love cheap. This hotel would probably horrify our students, who are used to a certain level of comfort and luxury. We don’t mind, because after all a hotel is just a place to sleep at night. 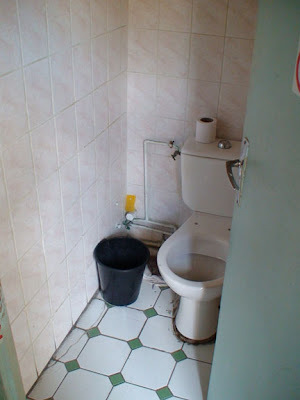 What’s the point of paying an extra 20 or 50 or 200 Euros just for a fancier toilet or shower? When you’ve grown up camping—and I mean real camping, the kind where you have to boil your water from a stream and dig latrines—staying in any hotel is a luxury. I will, however, not complain at all when I get back to our 1900 Arts & Crafts house with its king size bed and washing machine (it’s been 2 months since we’ve had one and that’s with cloth diapers) and handmade wool rugs and leather furniture.